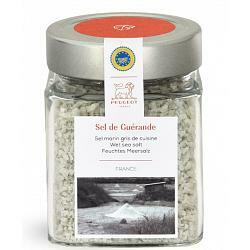 This jar of wet sea salt comes from the Guérande salt marshes in France and it is hand harvested, using traditional skills of the salt workers. This sea salt is natural and is reputed for its high concentration in minerals and trace elements. The salt is perfect for seasoning, cooking, and will subtly enhance the taste of your homemade dishes. The salt comes in a glass jar with a total of 240g / 8.5oz of coarse wet sea salt.